C2 Resource Studio Uses Cutting Shop and Unique Process to Create Beautiful Stained Glass Designs. 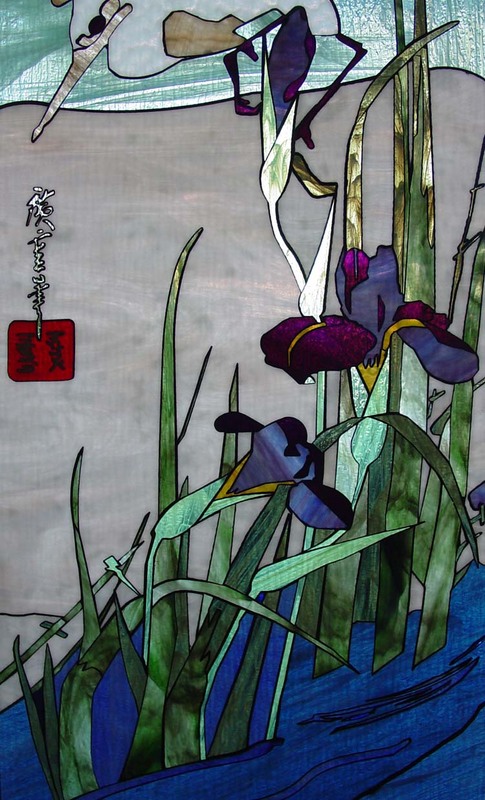 Chip Hunter of C2 Resource Studio, Holbrook, NY creates stained glass windows, doors, wall coverings and back lit panels for both commercial and residential premises. He has 25 years experience in the fabrication world as a resource for designers and architects and 12 years experience in cutting stained glass using a patent pending formula to create designs and panels that are 300-400 percent higher detail than traditional applications. 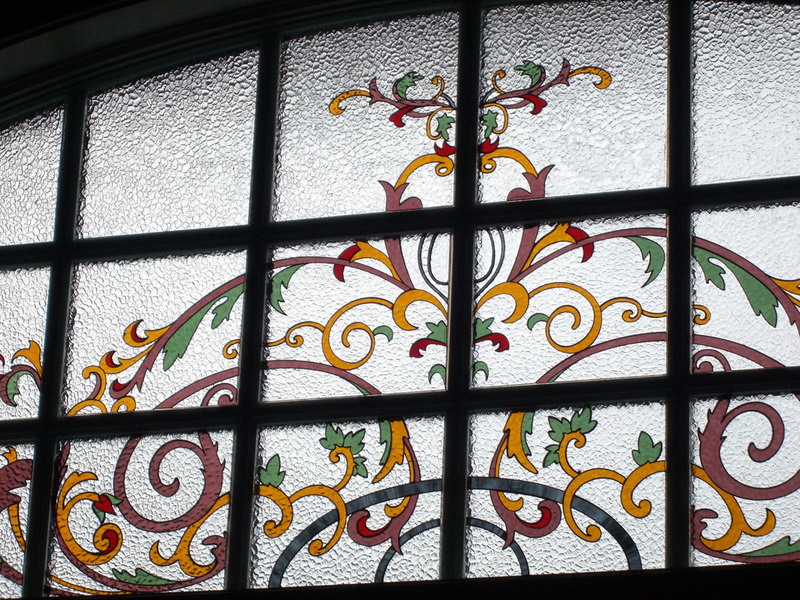 This process also allows for little to no maintenance, lead free panels and the flexibility to reproduce images so close to the original design, that many people can't believe it's stained glass. 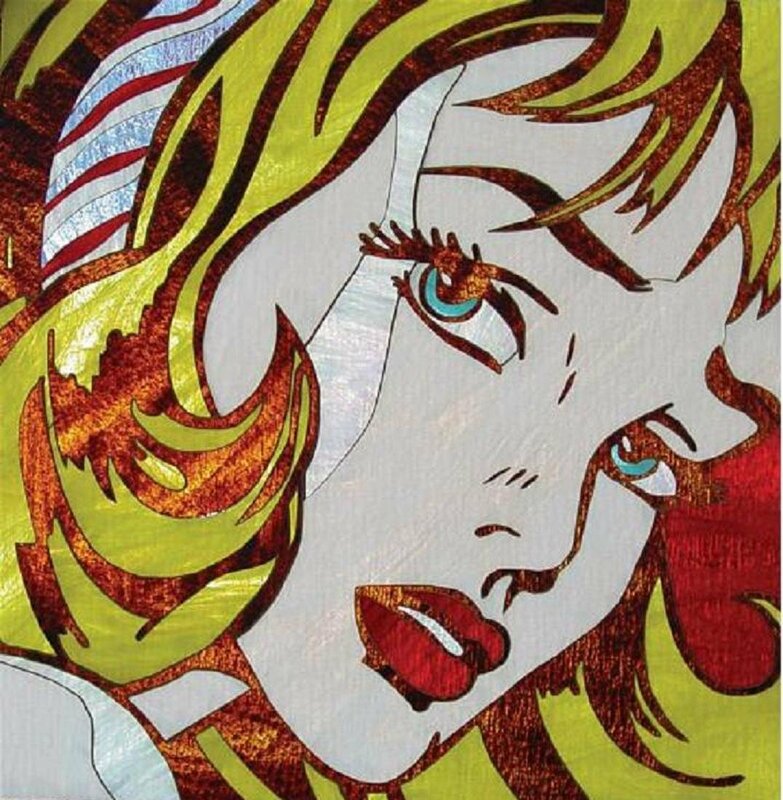 Due to the fragile nature of stained glass and the trade secrets he employs in creating these pieces, he consults for those interested in learning this process from start to finish. The process is called Fuzion®. He sketches designs to his client’s specifications and converts the images with Cutting Shop. The resulting vectors are then cut with a Flow water jet using special substrates and precise pressures and feed rates. Parts are cut from a variety of glass that make-up the colors, shades and textures required for a high quality art piece or functional architectural element. The parts, once assembled make beautiful customized stained glass windows, doors, panels, signage, back lit pieces and overall wall coverings. Visit C2 Resource Studio at www.c2resource.com to get a better idea of just some of the work produced by this progressive and innovative artist and feel free to contact him for projects or to add this unique process to your business. Hiroshige - Japanese 18th Century Block Print Artist - This is one of five panels (four single and one double door) that were commissioned by the United Nations Plaza as door panels in NYC. 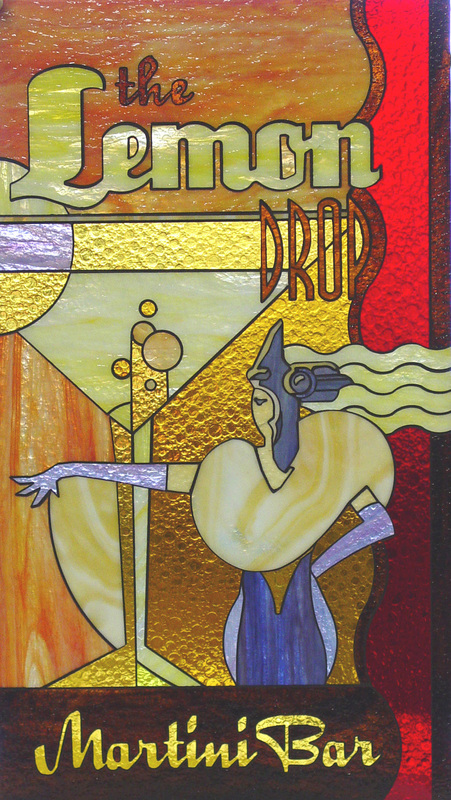 Lemon Drop Martini Bar - This recreation of a vintage deco poster was back lit and used for an inset cabinet panel over a personal bar in an upscale office suite. 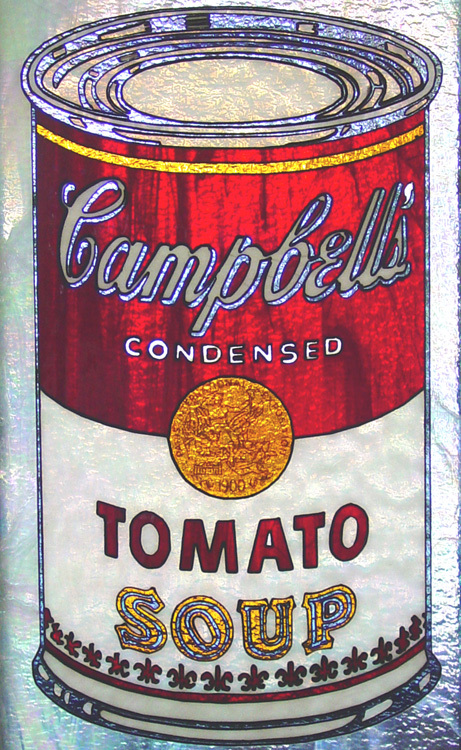 Andy Warhol's Tomato Soup Can - recreated to illustrate the level of detail possible with the Fuzion® process. Glass within glass elements are not possible with traditional stained glass at this complexity of design and detail and some of the pieces are less than 1/16" thick. 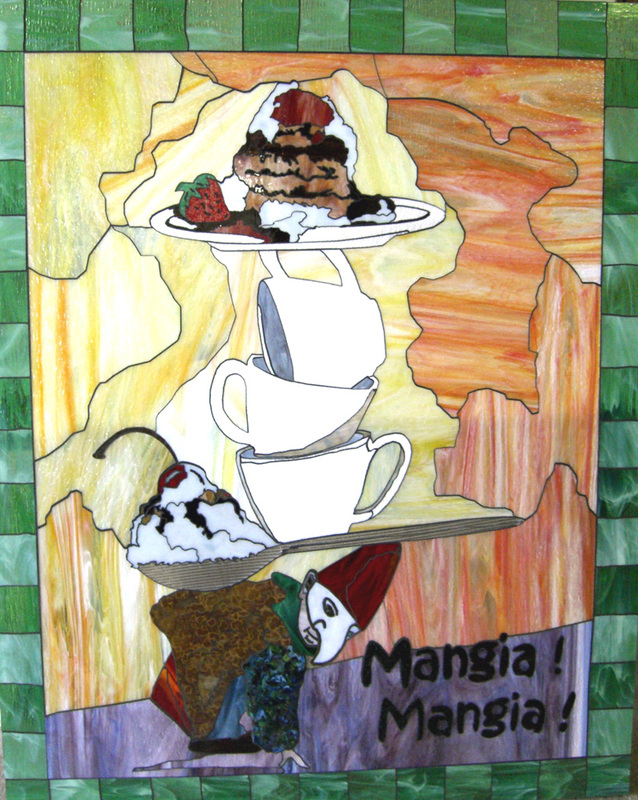 Mangia Mangia - These are two of 8 panels created to be inserted into walls and back lit at an Italian restaurant in NY. The theme was designed by our staff as cirque du soleil meets Italian food and service... fun family atmosphere. Custom Window inserts – This image is from an original design that was created and installed into an existing Pella window treatment. It allows for the client to have privacy, an elegant colorful piece of art and still allows a large amount of light to enter the home. Back to Cutting Shop Home.